A Sand County Almanac, and Sketches Here and There. New York: Oxford University Press, 1949. 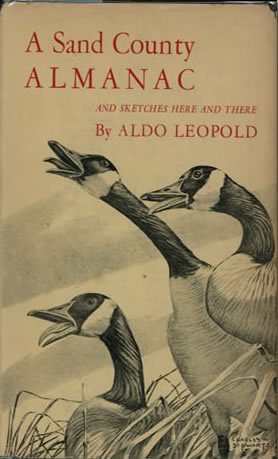 Published posthumously, Aldo Leopold's A Sand County Almanac is considered a fundamental work in environmentalism and environmental ethics. Leopold worked for the U.S. Forest Service early in his career, and became chair of Game Management at the University of Wisconsin. He was a pioneer in wildlife and restoration ecology, with many of his ideas based in the work he did on his farm in the sand counties of Wisconsin. He was also a founding board member of The Wilderness Society in 1935. Leopold is famous for his ideas concerning a "land ethic," which he describes in the present work. "The land ethic simply enlarges the boundaries of a community to include soils, waters, plants, and animals, or collectively: the land...a land ethic changes the role of Homo sapiens from conqueror of the land-community to plain member and citizen of it. It implies respect for his fellow-members, and also respect for the community as such." A Sand County Almanac has sold over 2 million copies since its publication.